"As I walk along a lonely street here in my hometown, I happened upon and Alley I have never ventured down. As I look around I see, signs for shops. as I wonder through I stop at each place and window shop. Each window is different as to what can be seem. Shops full of artworks, and Artists dreams! I see a garage door at the end of the street, And a sign on the door, that looks very neat. Silver Blonde Garage it's what it reads, Come inside for all your design needs. There is no window for me to look through, So I step inside, and there I meet you. With hair of silver, and a beautiful smile, your legs so long they seen to go on for over a mile. I look in wonder at the artworks I see, your talent is amazing it is clear to see. I look and I look, and with each piece I find, your talent is so special, it just blows my mind. In this would of wonders, one thing is true, The world is much brighter, since I met you! Cassianna's Silver Blonde Garage, If the truth be told. is a true world of wonders, that never gets old!" The Silver Blonde Garage is a space created to show some things related with the Achat game and Forum, like posters, banners, pictures and other artworks. I wil try always post new things and answer questions. I hope you enjoy this place and like the posts. 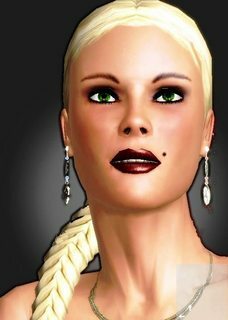 One of the things we use in our forum account is a Profile Picture. When we make our account in forum, we have the option to select many pictures to use. Many famous artists, singers and more. Yes we have many options to represent our face here. We have until silver blondes like Gwen Stefanny! I like Gwen Stefanny, but I wanted one picture related to my avatar in game. So I decided create a profile picture from the avatar. Not is a hard work, just make a screenshot of the avatar in the wanted pose and angle, edit in a image editor and make the upload to forum profile. Ready! Now I have a picture with my avatar face in game. It make easy recognize me inside the game and give me a unique image to my account. Congratulations on your launch. I'm sure it will be very successful. You should transfer your work across from Banner mania. The smart garage turned out.I he think will have success.Yes it is terrible to present that you could not return to us. Thank you very much for the messages of support from Anatasia97, Brandybee, LydiaRose and Vika92. Thanks to other visitors too. 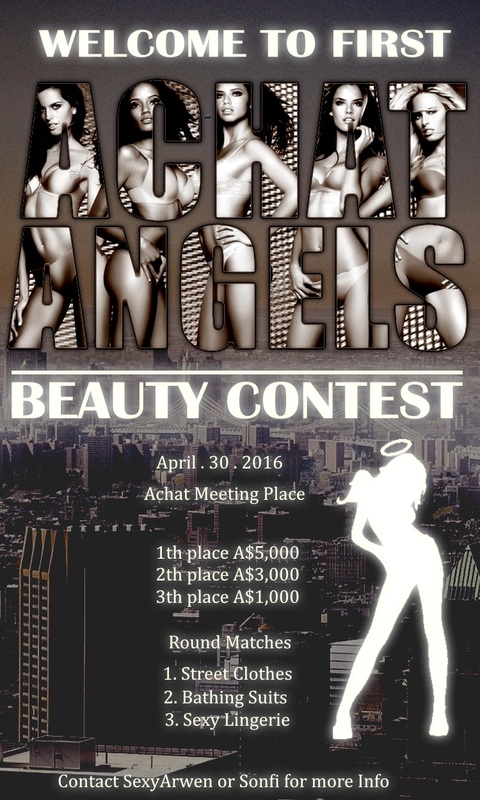 Kisses all..
Today happen the first beauty contest of Achat, called Achat Angels. This event is a idea of SexyArwen and Sonfi. To help the girls with this event, I did a poster to make publicity for the contest. And I share the poster here to yours. Iam one of the contesters too, and I hope all run good for everybody and we have many fun in event. Good Luck for al girls. Today I will speak about banners. When we created our account in forum, we have option to use one "signature". It is, a phrase or words to identify us in our posts. Well, we know One Image is more powerfull of one thousand words. So, we have the... banners. The banners are a image used in place of signature. Many times the banner have words too, or just images and our name. Is our symbol, and help the others to look ours posts and make a style very cool for our posts here. A "vogue" of banners in forum is important and I have a topic specific for banners here Silver Blonde Banner Store. The banners are cool. But we can make a little bit more funny if we add some animation effect to banner images. To make it, we need create many images, with diferente stages of positions and after mix all in a GIF image format to show the full sequence. It is all about my bannners. I hope you liked. When I will make new banners, I will post in this topic to show to yours. Congratulations Cassianna !!!!!!!!! Your own "thread", and well deserved. you do beautiful work. Your work is stunning and amazing. You are very talented and its lovely to browse around at your work. Its an amazing gallery already. Well Done & Thank you for sharing it. Hi Super Vika!!! Thankyou very much for your words, you are a great person and amazing friend. I feel much happyness with you post here in garage. You are the czarine! We love it! :) kissi for Bim!!! Hello again. More one contest and more one poster. This time is the story contest. I did the poster for the winners presentation and i want share with your here in the Garage. Nice to see a new shop open for the Forum village, good luck with your artistic endeavors.